Properties: Calcium is an essential body electrolyte. It is necessary for the functional integrity of nerve and muscle and is essential for the muscle contraction, cardiac function and coagulation of the blood. Calcium homeostasis is mainly regulated by three endocrine factors: parathyroid hormone is secreted in response to a fall in plasma calcium concentration and acts by accelerating calcium transfer from bone and by increasing its intestinal absorption and its renal reabsorption; calcitonin lowers plasma calcium by decreasing bone resorption and by increasing renal excretion of the ion; vitamin D stimulates intestinal absorption of calcium and decreases its renal excretion. Indications: Parenteral administration of calcium is indicated where the pharmacological action of a high calcium ion concentration is required, as for example, in acute hypocalcaemia, cardiac resuscitation and some cases of neonatal tetany. Intravenous injections of calcium have been used in the treatment of the acute colic of lead poisoning, and as an adjunct in the treatment of acute fluoride poisoning. Also, for the prevention of hypocalcaemia in exchange transfusions. Looking for ideal Calcium Gluconate Injection Manufacturer & supplier ? We have a wide selection at great prices to help you get creative. 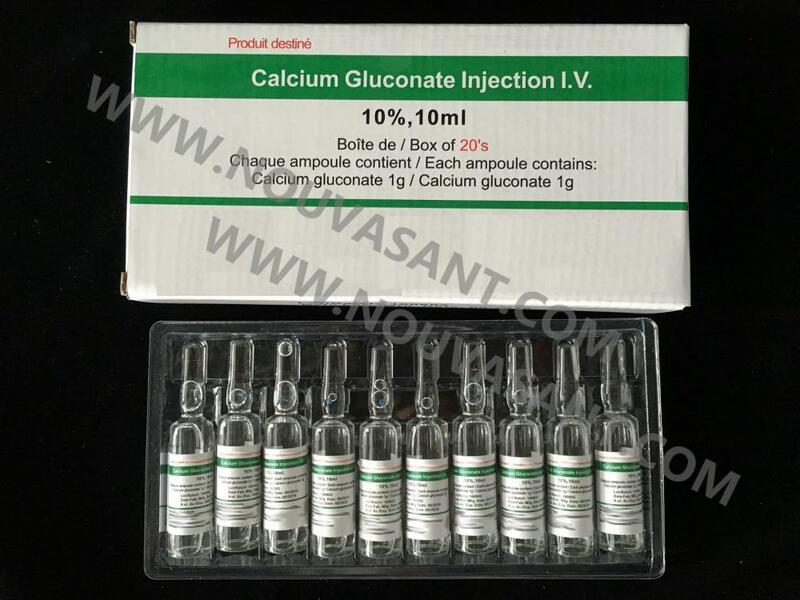 All the Calcium Gluconate Injection 10% 10ml are quality guaranteed. We are China Origin Factory of Calcium Gluconate. If you have any question, please feel free to contact us.